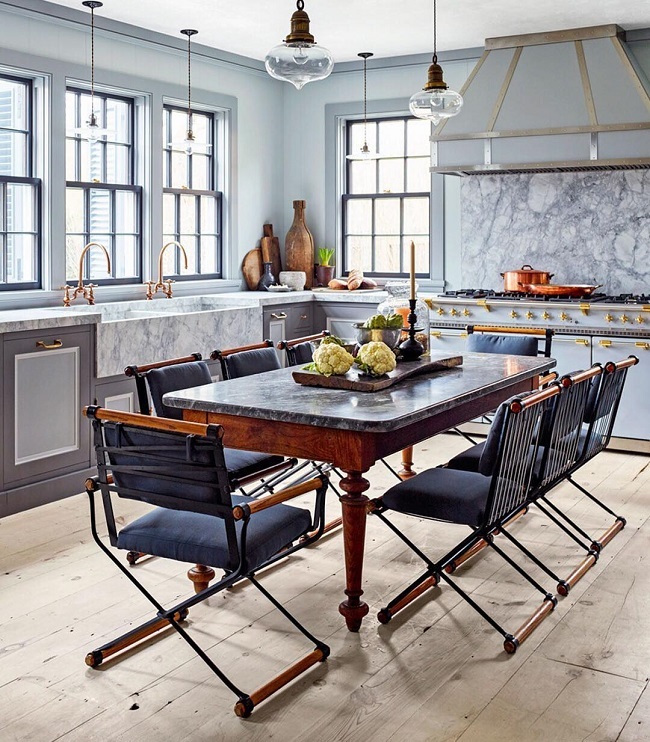 This amazing kitchen is designed by the talented Steven Gambrel! Filled with incredibly gorgeous details such as marble sinks, brass faucets, a custom-built range hood and an upscale range, this beautiful kitchen is simply irresistible! The double sinks and double faucets are definitely clever additions, don't you think? I also like the unconventional placement of a timeless dining table and cushy director-style chairs in lieu of typical kitchen islands in the space. There's so much to be inspired by this effortlessly stylish and swoon-worthy kitchen, don't you think? Are you drawn to this fabulous room as much as I do? What are your thoughts, my lovelies? Jessie this is a different approach ! I like it. A break from your typical island.